There’s both tenderness amidst blood in the water as cutthroat divorce lawyers battle it out in court and at home. 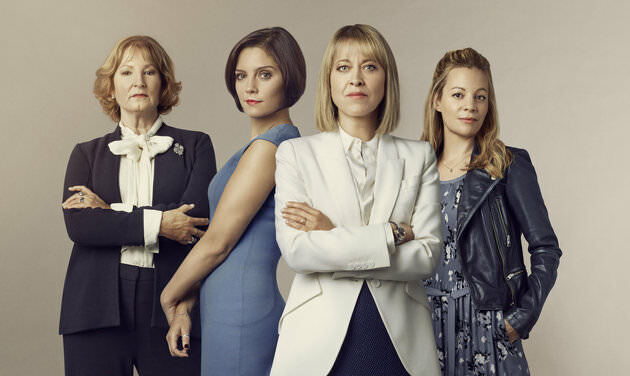 Just as Alan Ball did with a family funeral business in Six Feet Under, Abi Morgan’s (Shame, The Iron Lady, Suffragette) new BBC series does with a family law firm, mining high drama as the professional meets the personal. In The Split, we follow divorce lawyer Hannah Defoe (Nicola Walker, best known for originating the award-winning role of Judy in National Theatre’s The Curious Incident of the Dog In The Night-Time) and her family’s law firm, headed by her formidable mother Ruth (Deborah Findlay) and headstrong middle sister Nina (Annabel Scholey). 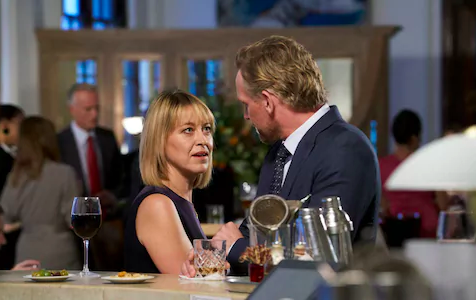 Leaving the family for a rival law firm after a bitter argument, Hannah finds success in the workplace while her own personal life begins to unravel when she encounters former lover (Barry Atsma) and her own estranged father (Anthony Head) returns home after 30 years. Over the course of Series 1, the Defoes come head to head with their past, each other, and plenty of messy divorce cases along the way. Despite being a law drama, there’s surprisingly little time spent in court, with much of The Split instead focusing on establishing and developing the rapid changes in its casts’ relationships. Investing emotionally in every one of the Defoes is key to that working, and the strong cast makes that work in just about every episode. As the main Defoe woman, Nicola Walker is a force to be reckoned with, an aspirational figure fully embodying strength and competence both at home and at work, passion always burning in her eyes. It is this constant presence that makes her most vulnerable moments all the more devastating in the second half of the series. Despite her ‘happy’ marriage to her husband (Stephen Mangan), Hannah gives off a constant air of solitude, from her separate, solo office space to her general ferocity and headstrong attitude. Meanwhile, Annabel Scholey is a surprise hit, balancing Nina’s struggles with her character’s inherent, fiercely likeable independence. While youngest sister Rose (Fiona Button) perhaps has the least interesting story arc and characterisation of the three, her impending marriage is a much-needed contrast to the dour, overarching mood of the series (set against gloomy London no less). When all three sisters come together, the workplace rivalry disappears, and there’s a real sense of tenderness and believability between them. In a wedding dress fitting for Rose, casual banter comparing the fitting to Say Yes To The Dress feels natural, while when all three meet up with their father again, there’s a united front to their sisterhood that resonates strongly, projecting the confusing mix of emotions that comes from this unexpected reunion. Deborah Findlay, though wearing a hardened, steely expression for most of the series, does what she does best in the latter part of the series – she captures the essence of hard truths in her controlled tone and heartbreaking look the moment she lets her iron mask fall. 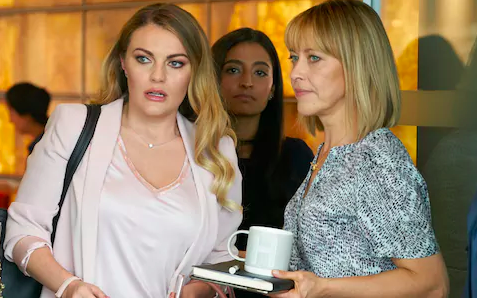 Abi Morgan delicately balances the initial case-of-the-week style of the show with prime melodrama, alongside building up a single big case between two clients (Meera Syal and Stephen Tompkinson) each represented by Hannah and Ruth on opposing sides. For a show about cutthroat lawyers, The Split is filled with beautiful, tender moments between couples, families and even one night stands, and shows how multifaceted humans, and specifically women are in love and life, helped in part by composer Isobel Waller-Bridge’s moody, mature soundtrack and brilliant camerawork that captures the underlying melancholia beneath upper class London. Much of The Split’s success can be attributed to how well it portrays the modern, working woman and the trials and tribulations she faces. What The Split does so well then, is to make just about all of its main cast relatable in some way, be it familiar traits in either the viewer or viewer’s friends in the process of the unabashed way it breaks down everything we were taught about marriage. And when the series does get into the process of handling a case, in Morgan’s hands, family law goes far and beyond what I assumed to be a dry and arduous process, ranging from tense, emotional settlements in the office, to a nationwide WikiLeaks type scandal leaking details of an Ashley Madison type app. One is constantly kept on one’s toes as you’re watching these capable lawyers fight battles in both the workplace and homefront, never looking back as they boldly forge ahead in each case and conflict, nothing ever quite turning out the way you’d expect it to when first encountered. Like in the practice itself, The Split moves at a breakneck pace when handling cases, while still finding time to slow down and capture the most intimate and painful moments of life. This is a show made classy by the fantastic performances by each and every one of the actors, their roles complex, smartly written and relatable. This is a show that prides itself on accurate depictions of lawyers’ lives, and one that plays a dangerous game as it dares suggest alternate moralities where an affair may be ok. As Hannah does over the course of six episodes, The Split forces its viewers to take a big step back to reevaluate their lives and decide what’s still truly worth fighting for. Viewers will be keeping our eyes glued to the drama that follows our new favourite television family business, and its sobering representation of the complexities and volatility of modern love in the working world today. For this review, Bakchormeeboy watched all six episodes of Series 1 of The Split. Catch The Split in Singapore on Friday, 22nd June 2018, exclusively on BBC First (StarHub Channel 522) and on the the BBC Player.